The number of cyclists on the Charles River Campus has increased 69 percent over the past four years, largely because of the addition of designated bicycle lanes on Commonwealth Avenue and the BU Bridge. Now, with the arrival of four Hubway bike-sharing stations on campus, it’s expected to jump even higher, fast. But bicycling in the city comes with a host of special challenges, particularly for those used to riding on less-trafficked suburban streets. There are the MBTA’s Green Line trolleys and thousands of cars, many driven by people who are not bike-sensitive. To get students up to speed in these areas, the University sponsored its fourth annual Bicycle and Pedestrian Safety Day September 15 at the Granby Street parking lot. 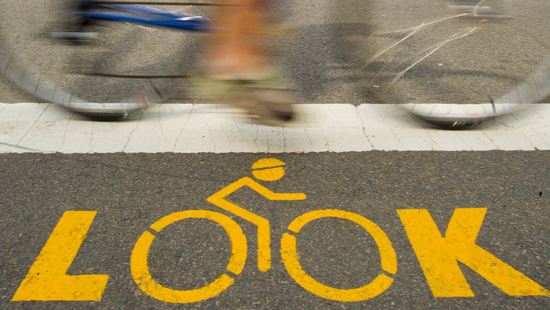 “The goal is to raise safety awareness and to promote respect between cyclists, pedestrians, and motorists,” says Webb Lancaster, director of operations for Auxiliary Services and a member of the University’s Bicycle Safety Committee. Lancaster urges cyclists to wear helmets at all times, follow cycling laws, and stay focused and aware of their surroundings. The event featured representatives from several local bicycle shops, who did free “ride ready” safety checks. They checked tire pressure, seat height, and yes, brakes. Bicycle and Pedestrian Safety Day included free demonstrations by the BU Police Department of the proper use of directionals and bike lanes. Representatives from Parking & Transportation Services offered free bike registration, which is strongly recommended for students who own bicycles. If a bike is stolen, registration decals make it easier for BU Police to return recovered bikes to owners. Students can register their bikes online as well. Registration also provides access to indoor bike parking across campus. Bike safety advocates recommend purchasing U-type locks to secure bikes. The lock should be passed through the rear wheel frame and the bike rack. Avoid cable locks, which can be easily broken with a bolt cutter. The event had lots of tantalizing giveaways, such as snacks, beverages, and safety accessories. There were raffles for gift cards, helmets, bicycle locks, lights, and tools, and a secret prize from Kenneth Elmore (SED’87), dean of students. A lucky winner picked up a free Felt TK4130 Fixie fixed gear road/track bike. Why should you pay attention? In 2010, according to the Boston Police Department, there were 340 bike accidents, including 6 fatalities, in the city. The same year, cyclists reported 118 accidents at the intersection of Commonwealth Avenue and the BU Bridge alone, reports Boston Bikes, a program administered by the mayor’s office. Commonwealth Avenue was listed as the most dangerous road in Boston for cyclists in the Boston Bikes annual accident survey for 2009. Additional reporting by John Fichera. He Rode for Charity. He Got a Lot More. Given recent chatter on this site, I hope this event is well attended.